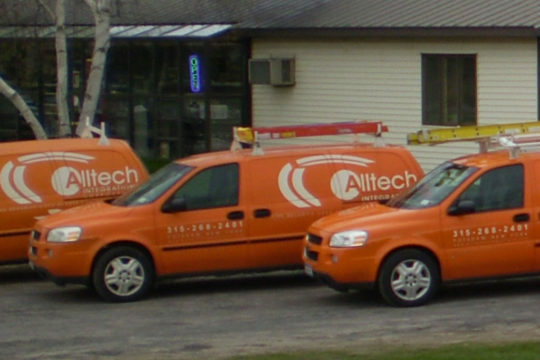 Alltech Integrations, Inc. was started in 2008 with the intention of providing security and peace of mind to individuals and families who own homes and/or businesses in Northern New York. We strive to provide world class, professional, ethical, and competent sales, service, and installations for all of our current and future customers. Over the last few years we have performed numerous installs for a variety of communities and customers in St. Lawrence, Franklin, Essex, Clinton, and Jefferson Counties. Our customer base ranges from homeowners and small businesses to commercial, industrial, and institutional locations. Alltech offers a broad range of security related services such as burglar and fire alarm systems, CCTV surveillance systems, card access systems, phone systems, audio/video systems, and medical alert systems. We listen to your needs and deliver the right solution. Our mission is to provide businesses, homes and institutions with the best quality service with competitive prices for projects of all sizes. We strive for customer satisfaction and won’t rest until the needs and requirements of your project have been filled. Beyond that, we are dedicated to maintaining long term relationships with our customers.